Save Marinwood-Lucas Valley - our community, our future: Even the French Publication LE MONDE wants to call us NIMBYS thanks to the George Lucas PR Team. Even the French Publication LE MONDE wants to call us NIMBYS thanks to the George Lucas PR Team. George Lucas has hired his Hollywood PR machine to paint Marinwood/Lucas Valley as NIMBYS. Recently, I was contacted by a writer of the prestigious Le Monde about questions concerning Grady Ranch. He totally mashed my points to portray us as wealthy NIMBYS and apparently was in league with the George Lucas PR hit team who wants to further its agenda in our working class district. Happy to answer questions to correct the record on Housing in Marinwood/Lucas Valley. Everyone seems to be chasing the "George Lucas vs. the Wealthy Neighbors" story that his Hollywood PR team has put out. There is much more to the story and the press has not kind. We have written extensively about George Lucas on www.savemarinwood.org and youtube and posts to various blogs. Here are some pertinent facts. 1.) Grady Ranch is located 4 1/2 miles up a country road. It has no water, sewer or other utilities. It is isolated and lacks public transportation. It will be run by a non profit and therefore contribute little if anything to community costs of the development. The surrounding community will be on the hook for paying infrastructure, new schools, police and fire service. 2.) Marinwood-Lucas Valley is a middle class neighborhood with moderate incomes. We have lots of retirees on fixed income. Many would qualify for subsidized housing based on their income. This is far from the picture painted in the press as "Millionaire Neighbors". In fact this is one of the biggest lies being perpetuated by the press as most locals will tell you. We are not southern Marin. Our neighborhood was one of the original working class neighborhood of Marin. It still serves that purpose for families who have been priced out of San Francisco. WE ARE THE ONES BEING FORCED TO PAY FOR SUBSIDIZED HOUSING while the housing advocates like Supervisor Steve Kinsey and Housing groups live like kings in San Geronimo Valley. They are the real NIMBYS of Marin. 3.) George Lucas is reportedly willing to invest up to 300 million dollars for 224 apartments. It is a very generous gift to all of the people of Marin. Affordable Housing is needed but for that kind of money he could build THREE to FOUR times the amount of housing where the tenants would have access to shopping and essential services. In fact he could BUY 450 HOMES in Marinwood at CURRENT MARKET PRICES and GIVE them to needy families. They would get a 3 bedroom, 2 bath home with a private backyard and no sensitive habitat will be destroyed. Why is George fixed on developing Grady Ranch.? 4.) Our community of 5.6 square miles is being burdened with 80% of all affordable housing not including Oakview Development and other locations currently seeking approvals. We think that the distribution of housing should occur EVERYWHERE in Marin and not be concentrated in a politically weak community far from the elites in Marin. 5.) We support affordable housing (especially for seniors) like the Rotary Village Senior Center in Lucas Valley which is well located, fits within existing densities of the community, is environmentally safe and financially responsible.. The current entrance to Grady Ranch. On a total area of 1037 acres, over 800 are open to the public for hiking. The development that George Lucas wants to build will be 50 acres. San Francisco, into a neighborhood reserved for seniors and local workers, the creator of "Star Wars' said he was undertaking the project to do "something nice for the people of Marin." The details of the project that the billionaire filmmaker wants to develop are just beginning to emerge. What is known is this: completely at his own expense on his own property at Grady Ranch -- an old Christmas tree farm that Lucas acquired in the 1970s, next to the famous Skywalker Ranch where he built his movie studios -- the dreams of more than two hundred seniors and working wage professionals who could not otherwise afford housing could become a reality. The boom in high-tech and its highly paid employees that has caused an explosion in home prices in San Francisco just across the Golden Gate Bridge, has spread to the rest of the region. In April, the median sale price of a home in Marin rose to $ 1 million with property prices (sales and rentals) increasing 13% in just one year. By comparison, nationally, rents have increased by 4% to 6% per year. "I think Marin is a striking example of what is happening throughout the Bay Area: the prices of our homes are well above what the people who work here can afford. We have not yet reached the levels of San Francisco, but the increases are spectacular," says Leelee Thomas, in charge of urban development for Marin County and its 258,000 residents. Medical personnel, teachers, police and administrative employees are among the most affected professions. Like half of the county's employees, Thom Tucker, a 38 year old single father, does not live in Marin. He spends an average of two hours a day in his car to commute between home and his office. "Housing in Marin has become inaccessible. I come from a modest background. I work hard and I would like to live where I work." Philip Thomas, 51, is in the same situation. To save time, he invested in a motorcycle. On his two wheels, his commute takes "only" 50 minutes each way every morning and every night. In winter, by car it takes close to 2 hours 30 minutes every day, often in challenging traffic. "I love my job, but it's getting too complicated for me. I'm thinking of quitting my job in Marin so I am able to work in Solano County (east of Marin), where I live." In addition to the financial aspect, opportunities are rare in a county that builds the fewest homes in the region. According to the latest report on housing in Marin, "smaller houses at moderate selling prices, are needed to meet the needs of singles, seniors and low income families." Today 12,000 people are on waiting lists to get a "affordable housing", literally "housing that they can afford." It is this type of subsidized housing that George Lucas wants to build Grady Ranch. Under US law, these dwellings must rent for or have loan payments that do not exceed 30% of household income. To claim it, you must meet stringent financial criteria: a worker who earns less than 80% of median income in the region - about $133,390 a year for a couple in 2013 (121,640 Euros) in Marin - can register on the waiting list. A senior must earn between 30% and 60% of median income. The need is obvious: the project would appear to be greatly needed. The cancellation announcement in 2012 was followed this past April by Lucas' submission of a "pre-application" (a kind of rough draft) to the local Marin government. It was not met with enthusiasm by all residents of Marin County. Some neighbors of Grady Ranch strongly oppose the construction of this housing community next door. Damon Connolly, elected representative for the geographic area where the project would be created, fears that Lucas' plans distort the region. Connolly thinks that the number of houses planned -- 224 -- is too much: it would be the largest such project in the county. "We need people working in Marin that can also afford to live here. However, that does not mean that all projects are valid. The community has expressed legitimate concerns and I will ensure that they are taken into account," he says. In reality, it is very complicated to undertake any real estate or urban development in Marin. In the late 1950s, while still a quiet suburb of San Francisco and when employment in the region was booming, a handful of Marin residents, supported by some politicians, fought against the development of shopping centers, highways and subdivisions that a number of developers dreamed of seeing spring up on this scenic piece of land. Among the major battles fought, the one that is most often cited in our research is "The Freeway Wars." Those now famous events of the early 1970s saw a small number of men and women -- self proclaimed "Green" but by the mores of the time considered more dangerous than Communists -- manage to halt and reverse the construction of over 990 miles of roads in Marin, including about 200 miles along the coast. The developers' objective was to multiply the number of residents by a factor of five times over forty years. Instead, after years of fighting, the "Green" movement eventually succeeded by 1973 in assuring that over 80% of the land in Marin would be preserved for agriculture or turned into parks open to the public: new development prohibited in perpetuity. Today, when the fog laps against the Golden Gate Bridge and one sees the incredible vistas of Marin, one can understand and be grateful for the struggle of the activists. On the bridge deck, little by little, the city disappears, giving way to lush cliffs that flow into the sea. Once in Marin, only one highway serves the main cities of the region. For the rest of the county, winding roads allow a glimpse of the Pacific Ocean at every turn or when they do not, twist throughspectacular Redwood forests. But every victory has its flip side. "Over 80% of Marin is protected permanently, which is great, but the counterpart is that we pay a high price, especially in terms of diversity," said Steve Kinsey, elected representative for the people of West Marin, the most restrictive area. Given the limited land available for construction, real estate prices, already affected by the development of San Francisco, rose again. Modest homes were pushed outside the county while the wealthier families, attracted by the fantastic environment so close to the city, built their main or second homes, gradually transforming Marin into the richest county in California in terms of per capita income: fifth richest in the United State. But Grady Ranch is not on restricted land. The property lies precisely in the less than 20% of land reserved for housing development. Under the law, more than 300 homes can be erected. "The project proposed by Mr. Lucas is a great gift to our community: a community that needs more housing at an affordable cost. Lucas' Grady Ranch development is consistent with the historic goals we have for the region," said Kinsey. Around the property, many houses also line the valley. Immediately next door to Grady, neighbors live in a huge mansion protected by an automatic wooden gate. Directly opposite is the home of one of the members of the band Metallica. Further east still is a subdivision and some housing units for seniors. Consequently, opposition and support go side by side. Some of the reservations against the project are in practical details -- like the fact that seniors are far from a health center (the road which serves the ranch is not connected by a bus line) -- the environmental concerns of some that fear more residents will mean more traffic and therefore more pollution. However, some opponents use language more heated and more politically charged. At a public meeting about the redevelopment of certain areas of Marin, including Grady Ranch, a mother and real estate agent took to the floor to express her opposition to the project: "Looks like you are volunteering us for ghetto," the speaker said to Susan Adams, a former elected official now replaced by Damon Connolly. Around her, some were shocked by her comments while others whistled in approval and applauded. This type of sentiment is not new to Tina Stolberg who has worked in Marin for eleven years. At 58, the school librarian is approaching retirement: a goal that the sale of her home will allow her to achieve she hopes. However, Stolberg is well aware that she will not find housing in Marin if she leaves her current home. That is why she is already enrolled on a waiting list for a hoped-for home in the planned Grady Ranch development. If the project actually goes ahead, Stolberg would meet the financial requirements that would allow her to be part of the list of potential candidates who will be selected by lottery. "I have heard these kind of comments before," she said. "We work very hard. We pay taxes. I just do not understand where all this venom comes from. I think some of these people are just afraid and uninformed about the facts of the project." Anne-Marie, 55, is a nurse. She, also, has registered on the waiting list. For her, who has lived and worked in Marin since her family moved there in the 1940s, fierce opposition to this kind of project is evidence that the area has changed. "I remember when Marin was inhabited by working class families. The attitudes were not like that. Today, the message is 'if you can't afford to live here, tough luck,'" she says. Save Marinwood, one of the leading groups against the housing project at Grady Ranch, insists that it is not opposed to workforce housing, in general, provided such projects meet a series of criteria. "We are not against the construction of workforce income housing, especially for seniors, such as the Rotary Village Senior Center in Lucas Valley. That project is well located, does not have too many units, does not alter the landscape and is financially responsible," explains Stephen Nestel for Save Marinwood. "The owners will include environmental arguments to preserve green space, usually ask for special status for the undeveloped areas to ensure that nothing ever gets built or that their development occurs after many years of political debate. This argument can eventually block the development of workforce housing and exacerbate segregation between social classes and multi-ethnic communities." In the case of Grady Ranch, a group of residents recently put forward a request to change the status of the road in front of George Lucas' property to that of a "California Scenic Highway." Such a designation would limit development in the area. But Stephen Nestel is convinced that the Grady project will eventually be built, regardless of the means of opposition deployed: "George Lucas' money makes things happen in Marin." However, nothing is certain. After the pre-application, a final draft must be submitted to the Marin County government. It will not only be voted on by public representatives, but also must face a number of practical problems that will be essential to solve in order to begin initial construction. One main issue: delivery of water during what has become an historic drought in California. It is not guaranteed that the Marin County body responsible for distributing such resources will agree to do so for more than 200 additional units of housing. PEP Housing, the non-profit organization which George Lucas chose to administer his Grady Ranch project, is very confident, given the huge advantage it enjoys. "Mr. Lucas gave land and money to develop his property. In my experience, this is unprecedented," says Mary Stompe, director of PEP Housing. "In the US, workforce and senior housing projects such as this are funded by a patchwork of monetary sources: from governments grants, non-profit organizations or private funds. The latest project developed by PEP Housing was a community comprised of 13 housing units reserved for seniors. Its construction required19 different funding sources and took seven years to get built." Thomas Peters, president of the Marin County Foundation, one of whose activities is the construction and management of social housing, is less optimistic. According to him, the project has a 25% chance to get off the ground. He sites a raft of permissions that has yet to be granted but also the power of nuisance neighbors. "However," said Peters, "this is a solid 25% chance as the effort is being spearheaded by a man of the stature of George Lucas. His land has already been allocated. However, there are years ahead in the construction of housing such as this," he said smiling. "It would be great if this project is realized. It is a matter of justice. And although 200 homes will not solve the housing crisis in Marin, Grady Ranch could serve as the catalyst for a series of projects which, combined, will make a difference. " Investment, jobs, world renown. Contrary to what one might think, those weren't the kind of things that future neighbors of George Lucas thought when the director and producer decided to settle close to their homes over thirty years ago. At the time, he wanted to build his film studios away from Hollywood to escape the dictates of the film industry. A region rich and discreet, Marin County, north of San Francisco, had no idea as to the type of neighbor they were about to get. The announcement of the construction of Skywalker Ranch, in 1978, caused an initial uproar in Lucas Valley, known by that name long before the arrival of the visionary creator of "Star Wars." The neighbors were convinced that not only the sports cars of his friends, but also cars filled with his employees, would pollute their roads and disturb their peace. Not to mention the new buildings that would, certainly, spoil the beautiful landscape of the valley. But George Lucas' Skywalker Ranch was built without the worst nightmares coming true of area residents. The buildings, which pay homage to classic, local architecture, are invisible from the road. As for traffic, it has not noticeably increased. Above all, George Lucas has acquired a total of five properties, opened to the public in large part due to Lucas' generous donation of land for accessible hiking. But almost thirty years later, when Lucas decided to expand his film studio, the same opponents rose up. By the 1990s, the filmmaker had obtained all of the necessary permits for the extension at Grady Ranch, adjacent to Skywalker, but had not yet started construction. In 2008 he finally decided to embark on the planned expansion but wanted to make some changes, therefore requiring additional permissions. While the project appeared poised to move forward, some of Lucas' neighbors threatened legal action if he continued with his plans. 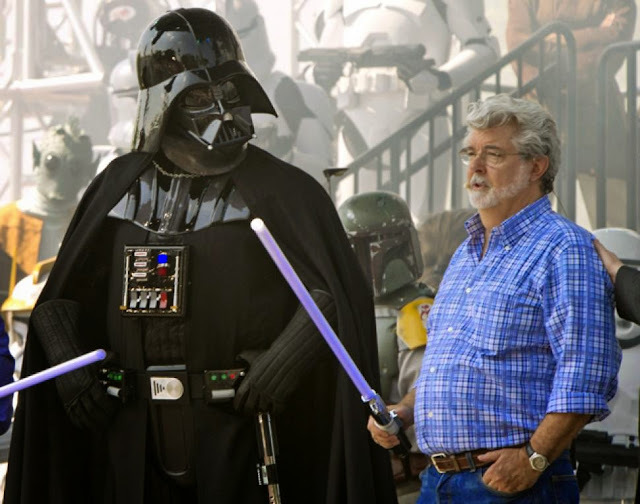 In 2012, George Lucas ultimately shelved his plans for Grady Ranch, saying that he would expand his studios in a community which saw it as "a creative asset, not as an evil empire." Instead, at Grady Ranch he now will build workforce housing and homes for seniors. However for Lucas' neighbors, the term "workforce housing" conveys nothing good. To some neighbors, the new plans for Grady smack of revenge. According to Save Marinwood, one of the main groups opposed to the project, George Lucas could afford to buy housing for all of Marin's families in need, at market rate, with the money he plans to invest at Grady. "He could build everyone a big house with three bedrooms, two bathrooms, a private garden and no sensitive habitat would be destroyed. Why does George Lucas insist on developing Grady Ranch?" asks Stephen Nestel of Save Marinwood. "George Lucas is doing this for one reason and one reason only," said David Perry, PR spokesman for the filmmaker. "George works in Marin. He raised his family in Marin. He simply wants to do something nice for the community." Advice on being an Environmental Activist.